A month after the second most powerful earthquake ever was recorded, the Alaska port community of Valdez remained in ruins. A hulking Alaska National Guard cargo plane’s mission April 25, 1964, was to deliver Gov. William Egan to oversee efforts to rebuild the town on a new site after the magnitude 9.2 earthquake. After dropping off Egan and surveyors, the twin-engine Fairchild C-123J Provider took off in a heavy snowstorm to return to Anchorage carrying the Guard’s adjutant general, Maj. Gen. Thomas P. Carroll, and three others. “He was just a regular dad, and then he was gone,” she recalled in a phone interview this week from Graham, North Carolina. “I’m just glad they remember him in that light, for the good he was doing,” Theobald said. He was only 21 months old when the plane went down, but he learned from his mother, Nettie Jo, about his father’s love for fishing and hunting. That’s what drew the family back to Alaska after his father’s active service days in the Air Force. He calls his mother the “real hero” in all this, raising her family and working herself up from the mailroom with the U.S. Fish and Wildlife Service to being the agency’s head of procurement for Alaska. She died in 2014, but he says she would be proud of the memorial. “I think she’d be very pleased, certainly,” he said. The night Carroll died, Egan had invited him to spend the night in Valdez and attend a dinner with him because of the poor weather. “I didn’t bring my fork,” Carroll joked when begging off on the invitation and promising to return the next day to pick up Egan, the Fairbanks Daily News-Miner reported at the time. One of Carroll’s sons, Thomas C. Carroll, reached the rank of brigadier general. 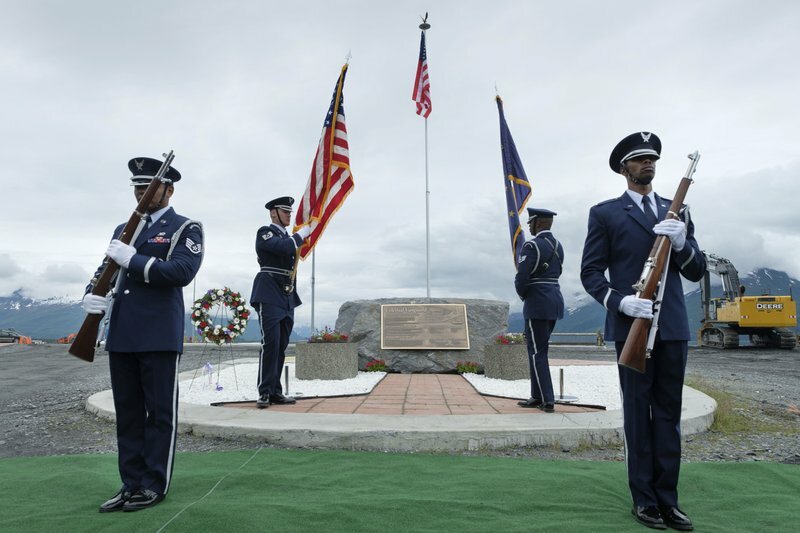 He also became adjutant general of the Alaska National Guard and also died in a plane crash. The younger Carroll’s plane went down in 1992 near Juneau. Rowe, the co-pilot, gained fame in the immediate aftermath of the earthquake. The Anchorage airport radio tower was destroyed in the quake, so Rowe circled Alaska’s largest city in a C-123 cargo plane, warning off other aircraft from attempting to land and turning his plane into an emergency radio tower, relaying what he could see to the outside world.